Hi Rod, you always talk about how price follows earnings. 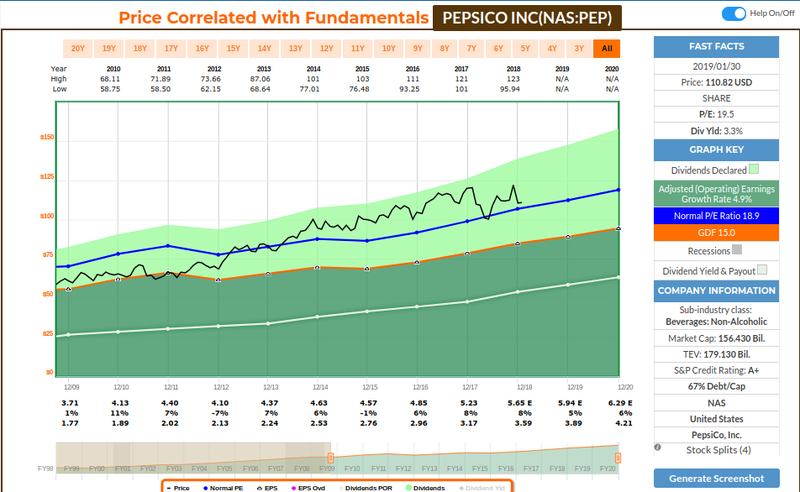 I am interested in investing in Pepsico, which you have purchased and recommended in the past. I was looking at the PE noticed that the price keeps going up but not the earnings. Are there other things that I am clearly not taking into account? I am new to analysis. Their P/E ratio hasn’t changed much, hence so we see a trend of price following earnings. It was a bit overvalued a few years ago, but it’s coming to a more reasonable valuation now. Earnings and dividends are estimated to continue to grow. This is just an initial analysis regarding valuation. You should take into account analysts estimates, how many analysts are covering the company (the more you have, the better is the consensus), how that compares to corporate guidance, and what is the analyst scorecard (it tells how well they understand and predict operating results for that business). Earnings calls have good insight on where they are with their strategy, strengths and weaknesses. Lastly, different timeframes help to plot a more reasonable multiple aligned to past operating growth and future (estimated) growth. I typically like 10 year time frame (8 years past plus 2 forecast). It covers about 2 business cycles. It’s not guaranteed, because forecast is unknown (it’s based on the information that we have today), but it adds enough components to help us make an informed decision regarding what the intrinsic value of the business is today and what is estimated to be in the future. When you buy a stock, you buy the earnings potential for that business. Hence it takes time to know if you made a good decision buying today, and why investing is for long term. Pepsi is a great quality company that is presently fairly valued and estimated to grow, in my opinion. Thank you for all the details. I definitely have a lot more to learn. Not sure if the charts I was looking at was giving the right information, because it showed PE increasing over the years. Do you plan to continue posting your purchases and list of fairly valued/undervalued companies? Yes! I’ve just been very busy with some other projects, but I will post soon. Thanks. I look forward to it. Your analysis and process is very helpful for new investors like myself.